Paraguay finally overthrew the Spanish colonial government on May 14th, 1811. Just before independence, for about 3 weeks, a new flag was raised. The new flag was selected. 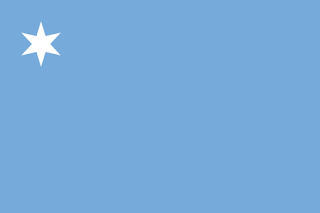 A simple blue banner, with a 6 pointed white star in the upper hoist of the flag. During the first national Congress after independence, 3 flags where on display. All being horizontal tricolours. The most common was a tricolour of red, white, and blue. Very close to that of the Netherlands. There where also a green, white, and blue flag, as well as red, yellow, and blue. All of which had their supporters, and all of which expressed the sentiments of freedom, and independence. In 1812, all these other flags where replaced with 1 horizontal tricolour. This was quite a long flag in its dimensions, and red, white, and blue. To differentiate from the Netherlands, the central white stripe was set to be wider than the blue and red stripes. Similar in pattern to the flag of Spain. In 1826, a new flag was brought in. Returning to the first flag, pre-independence, of a simple blue banner with a white star. This time using a lighter shade of blue, taking its cue from the flag of Argentina. The tricolour was kept as an alternate flag. However, the blue banner remained as the main flag until 1842. 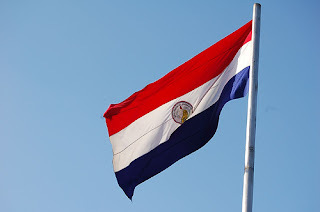 In 1842, on November 25, at the General Congress that year, they finally codified the Paraguayan flag. Returning to the horizontal tricolour, and placing the national coat of arms at the centre of the flag. The coat of arms features a central gold star, and then laurel and oak branches surrounding it. Tied together with a ribbon of red, white, and blue. The nations official name is written round this, and all is surrounded by a circle of red, white, and blue stripes. On the reverse of the flag, a different logo was used. Again, using the roundel, but inside, a lion holding a rod, topped with a red cap of liberty. The flag remained the same until the current flag was introduced in 1990. Albeit with some alterations to its dimensions over the years. The current flag saw the old emblem replaced with a new one. 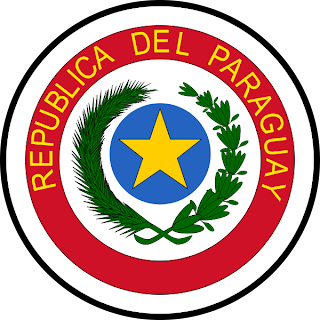 A gold star set in a light blue circle, surrounded by a palm and olive wreath, the text of Republica Del Paraguay in gold within a red ring, all inside a simple black ring. On the reverse of the flag, again, a black ring, with the text Paz Y Justica in a red ribbon. Under the ribbon, a golden lion with a rod, and a red cap of liberty. 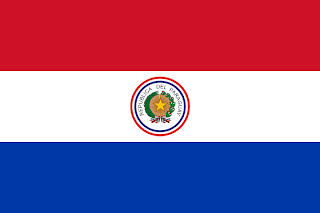 Paraguay is one of only 2 countries (the other is Moldova) which has a flag featuring a different image on either side of the flag.